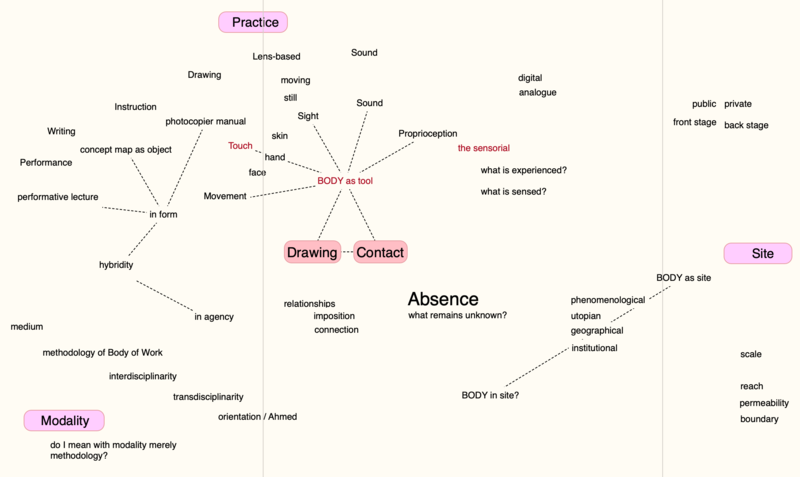 I had started to consolidate the various concept maps into a bigger one to outline the themes for the Body of Work itself. For the time being, much in here doesn’t connect or relate, yet, the spatial organisation and visualisation is useful: I have a beginning sense of how different media/forms can relate to the notion of the body as tool. And, if the body is site, then what are the spatial/geographical practices and dimensions this engenders. I am currently keen on holding on to the notion of modality, but this may simply turn into methodology (I am not sure if modality means register, or a particular relationship to a type of space: utopian, institutional, experiential), so for the time being it sits here as a poorly defined term.